Heralding Fall | "blackberry-eating in late September"
A few weeks ago, N. and I took some friends to Agate Alley bistro, and one of them ordered the Pumpkin Enchiladas. I was intrigued. I took a mental note: these would soon appear in my humble little kitchen. Then summer came to a close. School started. And that means I went crazy. This is my first year dissertating, which means I need to stop playing on the internet and start playing with ideas. And so the pumpkin enchiladas, and my ability to post here, went on hold. 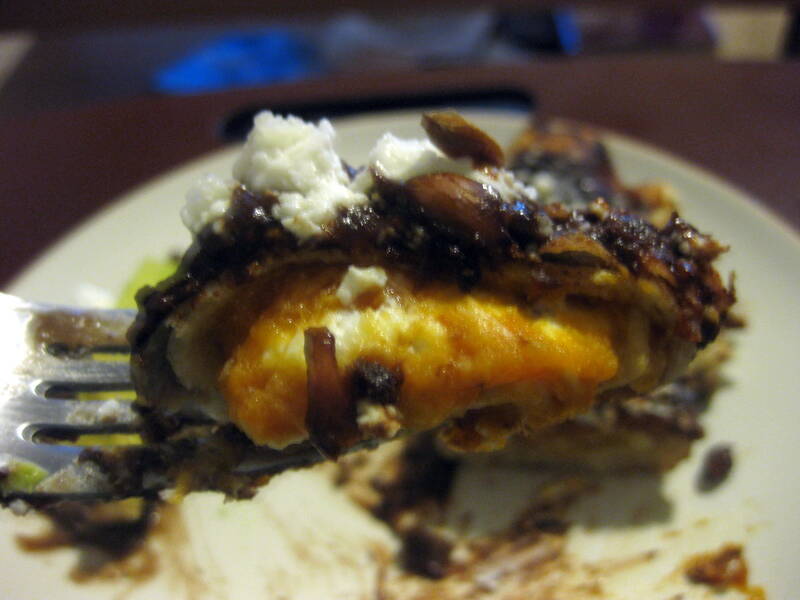 Pumpkin, Roasted Garlic, and Goat Cheese Enchiladas in quick mole sauce. Enough people have asked me for my recipe (hah!) that I’m going to post in a more traditional ingredient-and-process list format, to make it easier to follow. This is approximate, however, so tweak and twiddle as you so desire. I ended up making 5 enchiladas. Quick Mole Sauce, or your favorite mole, ready to go at the time of assembly. (I know, this is not a “homemade” mole sauce, and it doesn’t taste exactly the same. But it’s a good shortcut, I think, and let’s face it: if you want to make these enchiladas to enjoy on a weeknight, most of you aren’t going to take the time to make a mole from scratch. I’m not ashamed. I added extra unsweetened chocolate to this recipe, but otherwise kept it mostly the same). Preheat your oven to 400F. Place the garlic halves in a small dish, drizzle with oil, salt and pepper, and cover tightly with aluminum foil (or just wrap loosely in foil). 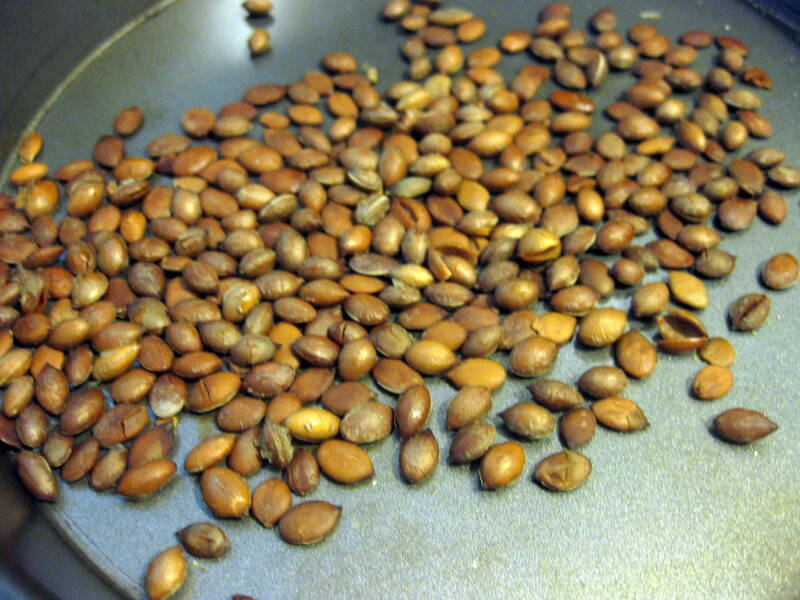 Roast in the oven for about an hour, or until cloves are very soft and very golden. Burnished but not burnt. Cool, then squeeze the cloves out of the papers and mash them into a paste. During this time, you can take advantage of the oven being on to roast your pumpkin seeds. They will only take 5-10 minutes, though, so don’t lose track of them or they will burn. Caramelize shallot slices in a skillet. They should be dark, dark, like French Onion Soup onions. Set aside to cool. Turn oven down to 350F. Spread the bottom of a baking dish (I used glass) with mole sauce. Prepare and assemble enchiladas: working with one tortilla at a time, spread the tortilla with the garlic paste, then top with 2-3 TB each pumpkin puree, goat cheese, and shallots (or to taste). Carefully roll up the tortilla and fit it, loose edge down, into the baking dish, pressing each enchilada tightly against its compatriots. Bake for 30 minutes, or until the cheese is soft and the sauce is bubbly. Queso fresco and goat cheese, depending on which types you use, don’t melt and burble the way other cheeses do, but they will soften and collapse on themselves a bit. To serve, sprinkle with toasted pumpkin seeds and enjoy with spicy refried black beans, Spanish rice, guacamole, or whatever you so desire! I was a bit concerned, at first, that the mole would overpower any other flavor, but it didn’t. This dish executed an intriguing and intricate dance between dinner and dessert. Ingredients that often appear in sweet circumstances remained decidedly savory. 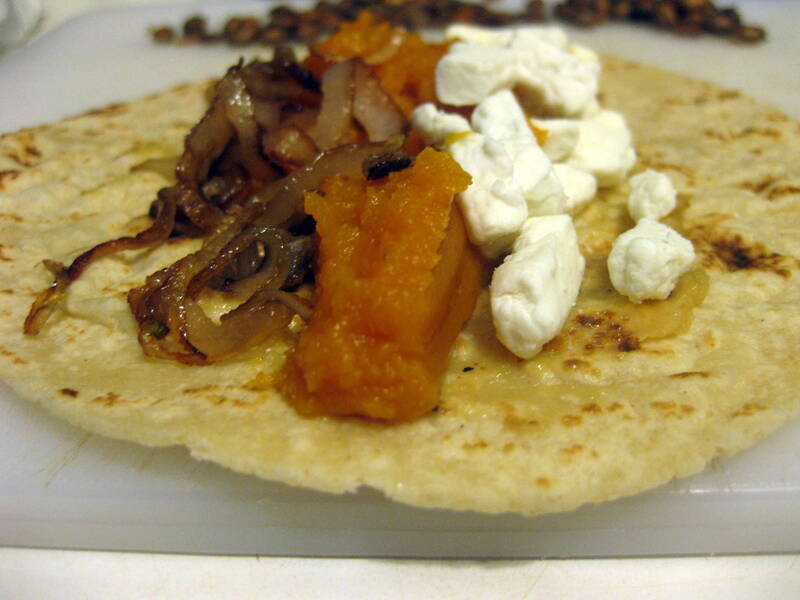 The pumpkin and the goat cheese were so creamy and rich, like a harvest cheesecake enfolded in a tortilla. I could have used more roasted garlic paste, but there’s always next time. The chocolate in the mole, too, holds the expectation of sweetness but none of the sugary suggestion of a dessert. Instead it provided a perfect bite of creamy-spicy-chewy-oozing-warmth, with an almost unexpected nutty crunch from the pumpkin seeds. 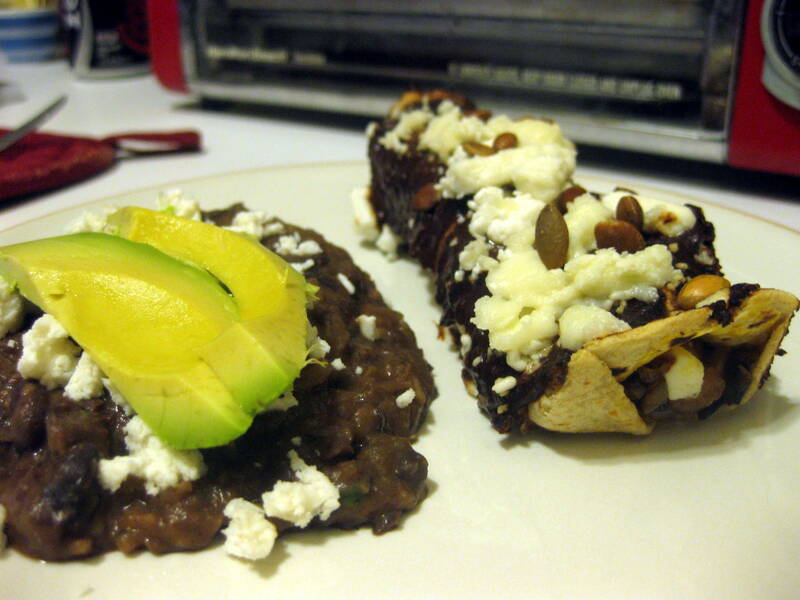 Also good were last scrapings and bites of loose cheese crumbles, sticky caramelized mole sauce in the bottom of the baking dish, and a last, perfect, creamy green square of avocado. Dark beer, perhaps even a chocolate stout, would be a lovely accompaniment. This entry was posted in Baking, Gluten-free, Recipes, Restaurant Recreation, vegetarian by Chelsea. Bookmark the permalink. Pingback: Frankenbrownies « "blackberry-eating in late September"